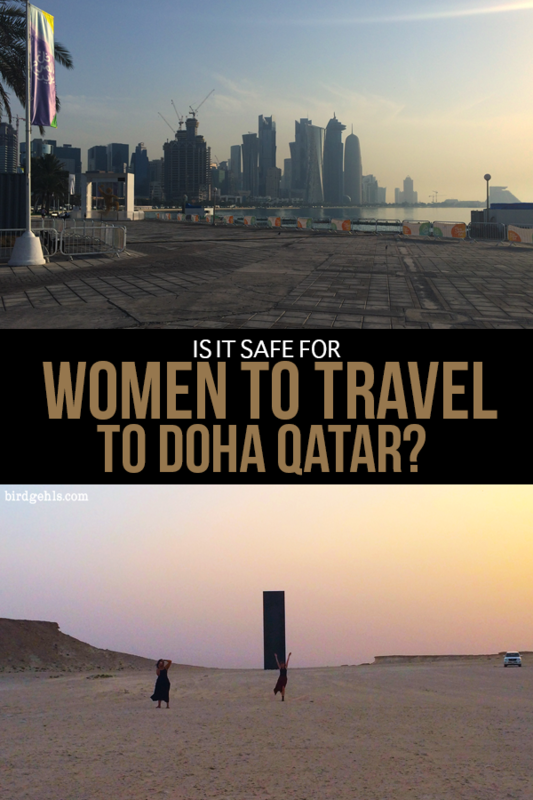 >> Is it Safe for Women to Travel to Doha, Qatar? Long skirts are about to become your best friend. 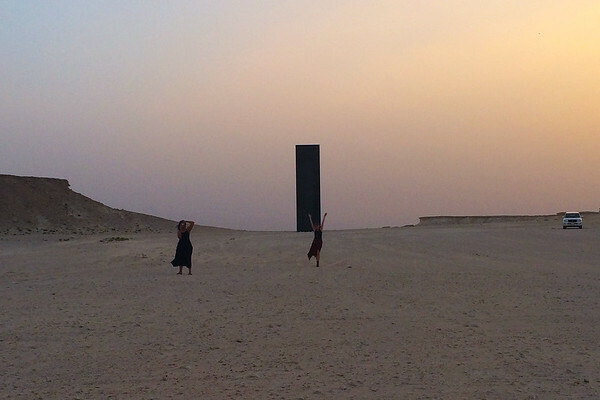 Snapped at the Richard Serras sculpture in the Qatari desert. Is Qatar safe? Particularly for women? How are you supposed to wear in Doha? What are the local customs? Is it really safe live in Doha as a single woman? Or other places like the U.A.E? What about if you’re just travelling to Qatar as a woman… and you’re alone? I lived in Doha for three months in 2014 for work and travelling there as an extremely sheltered Westerner, I wasn’t sure what to expect. I wondered how I was supposed to dress and whether it would be safe. As it turns out, the city is incredibly safe. I felt like I was in more danger walking through the mean streets of Sydney, than I ever did in Doha. That isn’t to say that you shouldn’t take certain precautions in travelling and living there. Many are the same as anywhere else in the world, but there are some factors that deserve consideration. Qatar is an Islamic country, where Sharia Law is recognised. There are certain rules and regulations that all citizens – whether they be men or women – are expected to observe and respect. Which is fair enough. It’s their country and therefore their rules and visitors should do their utmost to follow through on what’s expected of them. I’m sure you have a few burning questions, so I’m going to do my best to answer them. Overall, I do think it’s safe for women to travel to Doha – certainly to live there, like I did. Here’s why. Be sure to accessorise all your outfits with a small kitten. Where do these restrictions apply? Is it safe to walk around the city as a woman? The question on every woman’s lips. 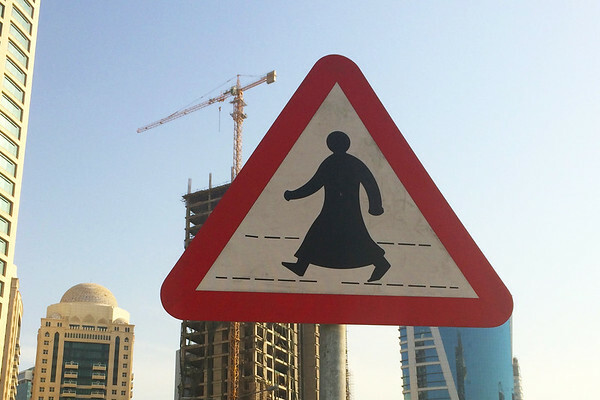 What is considered appropriate attire in Doha? Is the abaya a necessary garment? No. You don’t have to wear the abaya, or even cover up to the extent that you may imagine. As a rule of thumb, so long as your shoulders aren’t exposed and knees out of sight, you’d probably be right to step outside. My “uniform” in Doha considered of jeans, t-shirts, shorter skirts (such as the circle skirts that were in vogue at the time and I still wear) with tights underneath and three-quarter length leggings with a t-shirt dress. This suited my particular sense of style perfectly fine, but of course you can throw long skirts and maxi-dresses into the mix. This is generally how women are expected to dress whilst out and about in town, but there’s a few opportunities to bend the rules here and there, which won’t land you in hot water. I spent my three months in Doha living in a hotel, where I was able to wear whatever I wanted. I could don my bikini to go for a dip in the pool and wear my exercise shorts to the gym. Most people didn’t give me a second glance. What about outside city limits? I wore shorts on journeys whenever I headed into the desert, because I was generally with groups of expats who were doing much the same. I didn’t encounter any issues, but remember to do this at your own discretion. Sunrise (I think) at the Hilton. If you’re swimming at private beaches that belong to specific hotels, you’ll be fine to wear whatever you want. The same can be said for beaches outside of the city, because odds are there won’t be anyone else there. On the flip side, women aren’t able to wear western swimwear at the public beach of Katara, where you’re expected to cover up. One item I’d absolutely recommend investing in, is some sort of shawl or scarf. Whilst you are not required to cover your hair, this one item can prove itself invaluable in times of need. Take this scenario for example – you’re heading out for the night and your shoulders are exposed in the dress that you’re wearing. Throw your shawl on, wear it outside the house, in the taxi and then stuff it into your bag when you get to the club. Repeat when leaving. There are plenty of places that sell them in the souq. Vendors will jack the price up for foreigners, so don’t be afraid to haggle it down to something that’s fair for both parties. 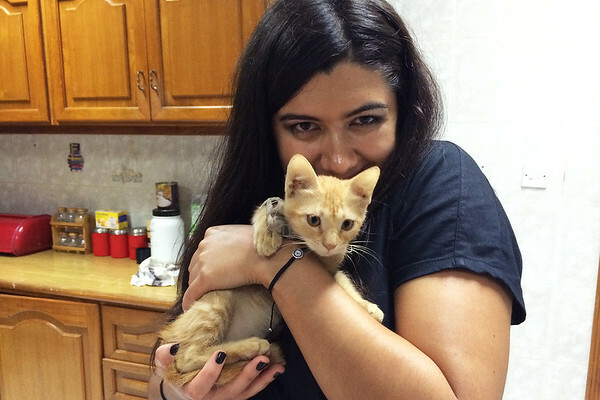 Making new friends in the souq. Yes! Expats in Doha seem to love drinking – not that you have to booze it up while you’re there. I didn’t drink whilst I was there, because I wanted to save money for subsequent travelling. That was my choice and you’re free to make your own. You can’t exactly stroll down the street for a bottle of red whenever you fancy it. Residents are entitled to what is effectively a “licence to drink” six months after living in the city. This card allows the holder to purchase alcohol and pork from two stores in the city. These stores close during Ramadan, so that the lines the week before are of epic proportions. If you don’t have a card, you can buy drinks at the many hotel bars. You’re also free to wear whatever you want to the clubs on hotel property. I had a bouncer try to throw me out of a club because I wasn’t wearing high heels. Make what you want of that. 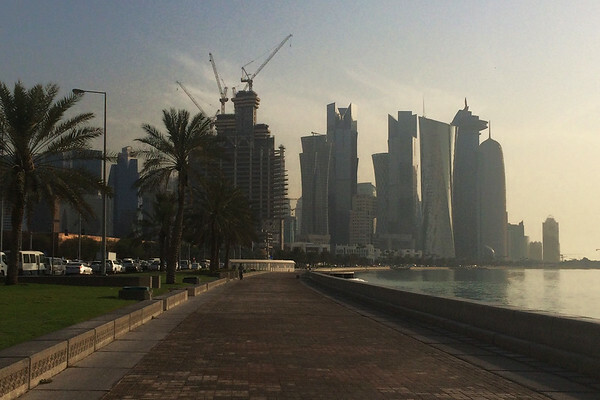 Dating in Doha is… tricky. Living in Qatar as a single woman is interesting. I know, because I’ve done it myself. It was hard to meet people at first (the more people you meet, the easier it becomes as the community is quite small), so I turned to Tinder, which was in its infancy stages at the time. It allowed me to chat to people during a period when I knew hardly anyone, before I made friends at work. It’s frowned upon for men and women to touch in public, which can seem strange if you’re dating from the perspective of someone from the Western world. It’s what is expected in Doha and must be respected. In a way, it was a rather good litmus test for the two possible relationships I could have had. I ran out of conversation with one fellow that I had good chemistry with, where we were left smoking shisha in awkward silence in the souq one night. The other and I could talk for hours over cups of tea, board games and cheese plates (we had cute but weird dates), but our actual attraction was short-lived. I love culture appropriate road signs. The entire city shuts down during the holiest month in the Islamic calendar. Being a Muslim country, the rules of Ramadan apply to all citizens, whether or not they’re fasting. Yes, you can still eat and drink water, but you can’t do it in public. The conservative dress-code is enforced. Most expats tread lightly, putting their heads down and working their way through the month. Once Eid has been and gone, the city explodes back into life. The clubs re-open, you can drink water in public and resume stuffing yourself with chilli dogs every Tuesday at Gordon Ramsay’s restaurant once again. For another perspective, here’s what it’s like to backpack through Pakistan during Ramadan. I’m not sure of what to put here, so a camel will have to do. Doha is a noisy city – people are constantly honking their horns and yelling stuff at each other from their cars, to the street. As a woman, there was the occasional wolf-whistle while walking. Truth be told, I’ve encountered more harassment in cities like New York and London. I certainly never felt unsafe walking through the city, even at night time, although it’s not something I’d make a habit of doing anywhere in the world. The only time anyone touched me was when I had my bottom groped by both a Polish boy and an Australian (not on the same night, thank goodness) in a nightclub. They weren’t locals however, they were Western expects! I unleashed hell on them – particularly the Aussie as he was an embarrassment to our country, especially when he threw up on his own shoes shortly afterwards. All in all, I enjoyed my time in Doha very much. It had a profound impact on me and the way I see the world. I’d encourage anyone to make time to visit this part of the Middle East. So, it Qatar safe? Probably, so long as you use common sense. Observe and respect the law and enjoy your time there. 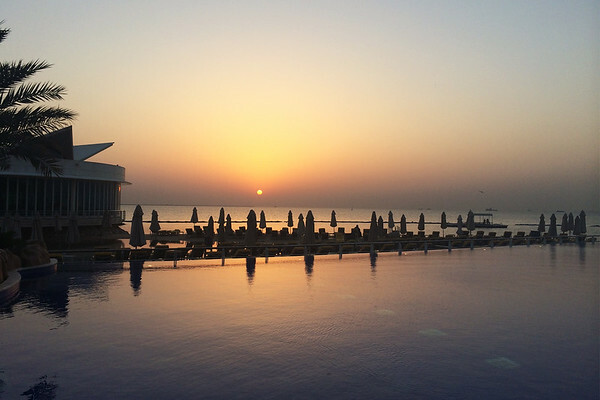 I stayed in two hotels during my time in Doha – the Marriott Hotel in City Center (click here for prices and availability) and the Mövenpick in West Bay (click here for prices and availability). Both were really lovely to stay in – excellent service and ammenities and felt very safe! Have you travelled to Doha? Would you go? Or consider spending a stint there as an expat? Thinking about travelling to Doha? Feel free to pin for future reference. This was super interesting to read! 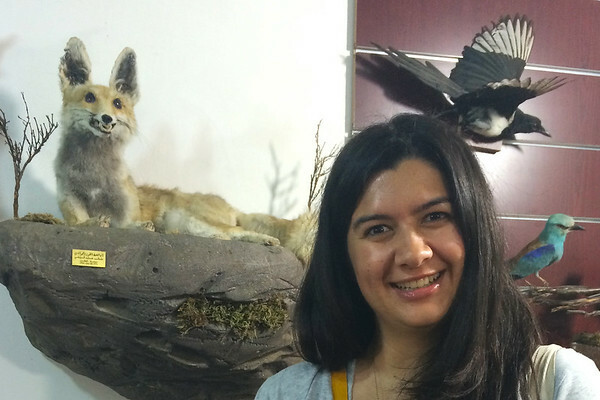 Although I’ve got some friends from UAE and Qatar who’ve already told me “it’s not like living in fun-free zone 24/7” it was super interesting to read an expat’s perspective. I think a lot of us (us being those who’ve never visited/lived in the region) have this warped idea of the Middle East, heavily influenced by what we see on TV and read in the news. When in reality it’s so, so different! I love the sound of chocolate hour too! My kind of place haha. OMG, chocolate hour was amaaaaaazing. Three years on and I still miss it every day. A lot of my fellow expat friends have mixed feelings about the city, which I think is because they stayed way past the expiry date on a place like Doha. I however, loved it. It’s the kind of place that is what you make of it. Although there are a lot of aspects of it I don’t agree with (such as the treatment of migrant workers and lack of animal welfare), it’s still a very interesting city, that’s just going to continue gaining momentum as it inches its way further and further onto the world stage. And the food is undeniably good. Aw in a way it’s great that you got out before you got sick of it! Totally agree with you about the migrant workers/lack of animal welfare. I have a lot of Indian friends who are actually a lot more qualified than me for certain jobs, and they always tell me how if we were to both move to the Middle East, I’d probably get paid twice as much for doing the same job. If they even got a chance at the same job. I’m glad too! Yeah, I will say that I really don’t think much of the treatment of certain groups of people there. A lot of the taxi drivers were engineers, doctors, but had zero chance of getting a similar job there… hence the taxi driving. When it comes to racism, every country is guilty in some way or another. Chocolate hour?? I didn’t see any mention of this in the article… I am SO interested, as I’m visiting a friend next week who lives there!! It’s from an earlier iteration of this post… one of the hotel’s in West Bay (the Mövenpick, to be precise) did a chocolate hour every day at five, except during Ramadan! Have fun! I’ve done a transfer through Doha, and I made sure I had plenty of time between flights so we could do the free city tour that Qatar Airways offers. 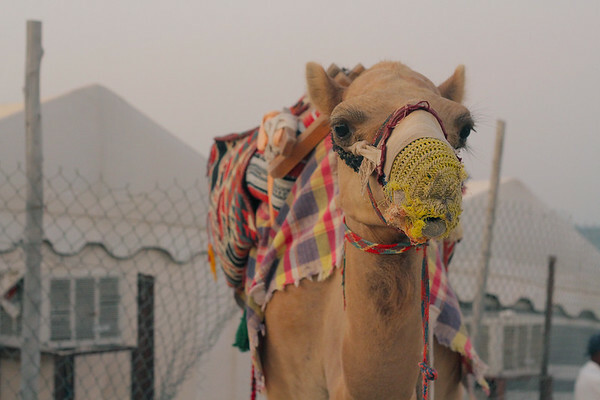 It was enough to put Doha on our list for a proper visit when we travel through the Middle East this year. It’s a city worth exploring. I’ve not been for three years and am sure it’s become unrecognisable in my absence. Hi!! I’m reading all comments towards this post and I’m actually interested..I have considered going to Doha and traveling alone but I will be meeting my fiance there. So traveling to Doha is nothing to be scared about? I wouldn’t think so. It’s just a case of using basic common sense, as with any place (and adhering to the dress code). I personally felt very safe there and it’s expat central to boot. Interesting article, as a man I had never considered Doha to be at all unsafe, so it’s interesting to read a woman’s perspective. I am going to Doha for a day in March and I’m planning on wearing the traditional male clothing for my photographs! I agree with you that is made sense not to buy expensive drinks and use the money to visit Iceland. I bought my brother some of that clothing as a souvenir! Yep, don’t regret that decision in the slightest. Enjoy your day there! I haven’t travelled to Doha but I would go there. Thank you for your post. I think it is very informative and can change peoples preconceived ideas. I travelled during Ramadan in Morocco and found just as your said, everywhere closes down. Yeah, it’s weird being somewhere during Ramadan. A really interesting experience as an expat, but from a traveller’s perspective, I probably wouldn’t want to travel anywhere Islamic during that period of time again – just because it limits what you can see and do, even as a non-Muslim. Such an interesting perspective. I always imagined it would be hard to be a feminist woman in the middle east, but of course, it is different in different places. I like to cover up in the sun anyway — for sun protection, not modesty — so that part wouldn’t be too hard. Especially if you have a private pool or beach to swim in. You have to bite your tongue a lot… the sun over there is vicious, so I didn’t felt too bad about covering up, either. My partner and I want to visit Doha in the next few years so these tips are really helpful! What was it liking living over there? Did you find you had lots to do? I am a primary teacher and there are lots of international school jobs with amazing pay over there so I am tempted but not sure what it is like to live! Oh yeah, you can earn insane amounts of money. I worked a lot… but my days off were filled with desert adventures and many social outings. I had a ball, really. It was a special time. I read every word of this post. Though I don’t have immediate plans to visit middle east, I’m mostly a solo woman traveler, so thanks for the guidance! My only connection with Doha was when I had transit there, while traveling from France to India! Lots of people seem to pass on through! I think it’s fine for solo travels, much in the same league as Dubai. It made London seem like a walk in the park, that’s for sure! No neither, but there’s a range of people from all over the world, so it’s not just Muslim people who will whistle at you in the street… it’s still a very interesting place, worth visiting. This was such an interesting read! I’ve never traveled to this part of the world before, but I’d love to in the future and have always wondered about what is appropriate for travelers to wear! So interesting about the concept of having a “license to drink”, had never heard of that before! The only other place I’ve heard of it is in Longyearbyen in Svalbard, as an old mining tradition! Good question! I think you should at the very least be able to check out the Souq Waqif and the Museum of Islamic Art. I’d suggest getting in contact with a specific tour company – maybe Qatar International Adventures, to see if they still run tours during Ramadan. I recommend dune bashing or seeing the Richard Serras Sculpture out in the desert. The city does rather go into lock down (I spent the entire month of Ramadan working), but you never know. Good luck! Hi I’m English and have lived in Doha for 25 years ended up marrying a local. I have to say that your account is fairly accurate of what doha is like. It’s a nice country ridiculously safe. When I was a teen I would be out till three in the morning and wouldn’t bat an eyelid over my safety. There are a few catcallers but tbh as the country is developing more and more you see less of it. If a girl was wondering around in a micro mini round on of the malls chances are she would be hit on but that’s about all now a days not like when I was younger. Good to see an honest review of the place. Thanks Elly! It may be a tad outdated – I haven’t been there for four years now. As I said, I always felt safe there and I used to sometimes walk home from work at night. I mean, I’ve worn shorts in London on hot days and have been catcalled there too, to be fair. I enjoyed my time there and hope to return someday! Epic that you’ve been there for 25 years! It must have changed so much in that time. I loved your post. Gave me a great insight into Doha! I’m a single woman traveller myself and I will be visiting Doha in July. My plane touches down at midnight and I have to catch a taxi on my own at that time to a hotel. Do you think I have anything to worry about in terms of safety? I’m just taking extra precautions! I would love to hear your advice. Hi Kristina, I think you should be okay, of course as women we can never be 100% on these things, quite sad. I think the cost should be around 40QR. Pretty sure Qatar has Uber now too if that’s something you’re more comfortable using. Just make sure you either negotiate a price before setting off or they run a meter.